The People Database archive is considered as a meeting place for discourse, ideas and action. The leading thread is the collection of passport photographs. Used as a mirror, they provoke an answer given by artists, philosophers, musicians, writers and other interested participants. The site of Thurn & Taxis, in the context of the exhibition Here & Now, lends itself perfectly as a social structure for this cultural exchange. The archive-in-residence will call into question an interdisciplinary investigation between visitors, invited artists and resident artists. 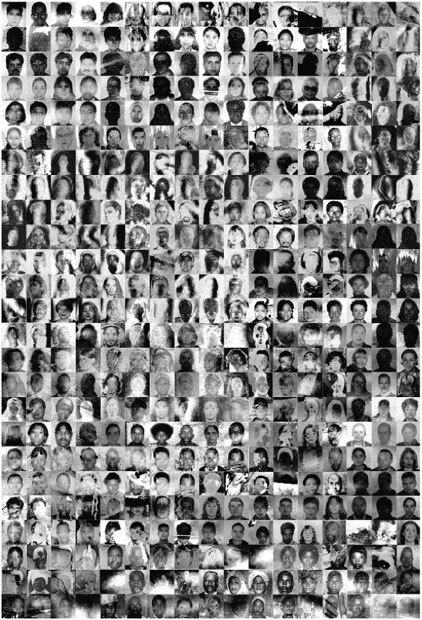 The people database archive is an area of thought about representation and self-representation about identity and individuality, about subject as object, about memories and emotions, about the self and the other, about the conscious and the subconscious, about exhibitionism and voyeurism, about private and public. The people database archive profiles itself as an open system, a laboratory to experiment and exchange. 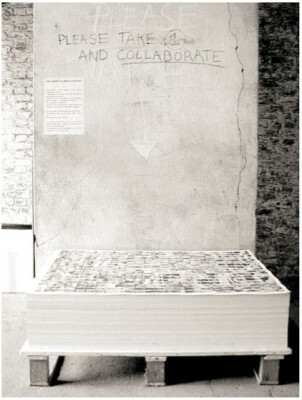 In collaboration with other artists it explores the varied and provocative presence of artistic alliances in our culture. Collaborations underscore as well ethical as aesthetical questions. They offer a challenge to the ‘romantic vision’ of the individual artist who works in solitude. These collaborations with artists are presented as an entire and identified work within the people database archives. A lot of people participated already in this project. They were asked to pick one or more photographs and write, draw, compose, photograph, film… their own reaction to them. They used their mind as a camera to zoom in on another person’s face. This act quickly led to some fundamental issues occupying their onconscious mind. They wrote their own story, articulated their own thoughts, desires, philosophies and dreams. 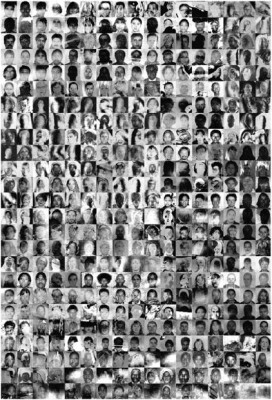 The people database archive works with the extensive collection of pictures and reflections that come out of this permanent collaboration. It will re-present and re-produce them in a distilled, art form, making a scan between language and image, between private and public.The aesthetic quality of the photographs is interesting as it stands as a metaphor for different aspects of identity. Luminosity and obscurity, positive and negative, open and close. The images partly conceal the pictured person and give an opportunity to the mirrored person to dis-cover himself more easy. They force us to a confrontation with the Self by the luxury of a disguise: the Other.